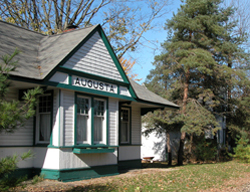 New Augusta Historic District is an excellent and intact example of the type of railroad village that dotted the once-rural townships surrounding Indianapolis. With the completion of the Michigan Road, a small village called Augusta developed at the corner of present-day 71st and Michigan Road. With plenty of travelers using Michigan Road, the small village grew to have general stores, a post office, and other essentials. In 1852, the Indianapolis & Lafayette Railroad opened its route, parallel to the Michigan Road about 1½ miles west of the original town of Augusta. Pike Township resident William Hornaday realized the opportunity and platted Hosbrook the same year. Later, the U.S. Post Office requested that Hosbrook be renamed to what became known as New Augusta, because another Hosbrook, Indiana, already existed. Merchants moved from Old Augusta and set up shop in the small downtown area on Dobson and Pollard Streets, complete with village pump. The c. 1890 Odd Fellows Hall at 7202-4 Dobson is the largest remaining commercial block. A concrete-block early 20th century Masonic Hall at 4705 Pollard has a stepped gable roofline. The founding of the town itself and the New Augusta Depot on Purdy Street are directly related to transportation. This classic c. 1890 wooden depot is privately owned and remains in excellent condition. The district also includes both typical vernacular and high style houses of the time. 7102 Dobson is a well-preserved “L” plan Queen Anne cottage. Local builders used variations of the “L” plan from the mid-19th century to the early 1900s. Several good examples of Italianate can be found in the district, including 7123 New Augusta Road. The Salem Lutheran Church has roots dating to 1836, but by 1876, the group needed a larger sanctuary. The church hired architect E. V. Enos & Son to design the current Romanesque Revival brick church, completed in 1880. Visitors to New Augusta will find sheds, carriage houses, small barns, and even root cellars in back yards. Many residents kept farm animals for family use or may have tended farmland outside the village. 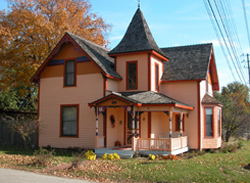 New Augusta Historic District is located on the suburban northwest side. The district in roughly bounded by West 71st St., West 74th St., Coffman Rd. and New Augusta Rd. Residences are private homes. Various commercial buildings allow interior access. INDYGO bus line from downtown: #34 Michigan Rd. disembark at 71st and Michigan.